Recently, an email about a new public market opening in my neighborhood caused me to go on a forward-frenzy. (You’re welcome, Boston Public Market.) I was so excited that I shared it with every single family member, friend, or co-worker who lived in that area. While no purchases were directly made from that email, Boston Public Market's reach was greatly increased -- all because it sent an interesting, relevant email to me. When most people think about a successful email, they just think about deliverability, opens, and clicks. But a truly engaging email should do more than that -- it should compel subscribers to share the message with others. This not only helps increase your reach, but it also can lead to an increase in conversions, all while delighting your subscribers. Win-win-win, right? So how do you get people to forward your emails? What types of messaging and content gets shared the most? Does including certain email tactics lead to an increase in shares? In a research report conducted by Litmus, nearly half a million email sends were examined to reveal why some emails go viral ... while others do not. Here are four main reasons why an email gets shared. 1) It's a triggered or segmented message. As inboxes become more crowded, subscribers expect messages tailored to them. In fact, 25% of people will unsubscribe if they find the content irrelevant. In our research, we found that targeted emails are usually 90% more viral than untargeted messages. By tailoring your messages based on behaviors and attributes, your subscribers are able to relate to your emails -- and are more likely to share them with others. Segmenting your lists based on attributes, such as subscription levels. Setting up triggered messages in response to subscriber behaviors, such as registering for a webinar. Who’s Doing a Great Job? You can see a great example of a segmented message below. 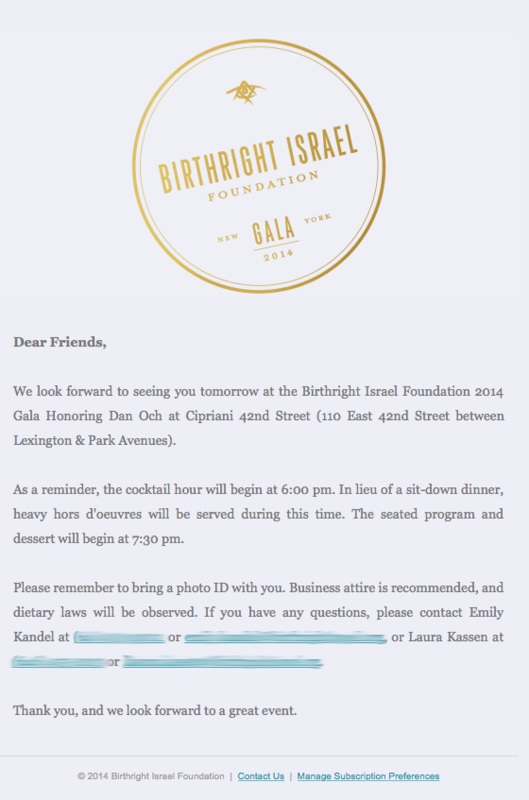 The Birthright Israel Foundation sent an email to their Gala registrants with details about the event. Subscribers were interested in the content because it provided important information about something they were interested in. Not only did they read the email, but they also shared it with others. The targeted messaging of this campaign propelled it to the top 1% of viral emails tracked. 2) The content is personalized. When it comes to email, the more relevant it is, the more successful it will be. One sure-fire way to make something uber-relevant? Personalization. It involves tailoring your email for each subscriber based on their unique attributes -- such as birthday, purchases, and the like. In our study, we found that the most forwarded emails were 4.5X more likely than the typical email to include personalization. Your quintessential first name personalization isn’t likely to make a huge difference in virality, but more creative personalization techniques, like including the picture of the recipient, are. So use the data and information you have on your subscribers to tailor your sends for them. Do you have purchase history? Their headshots? Information on what activities they took on your website? Personalizing your emails using more relevant information can delight your subscribers and encourage them to share your emails. A great example is the one below from CarMax. It sends a personalized message to those that have reserved a vehicle. 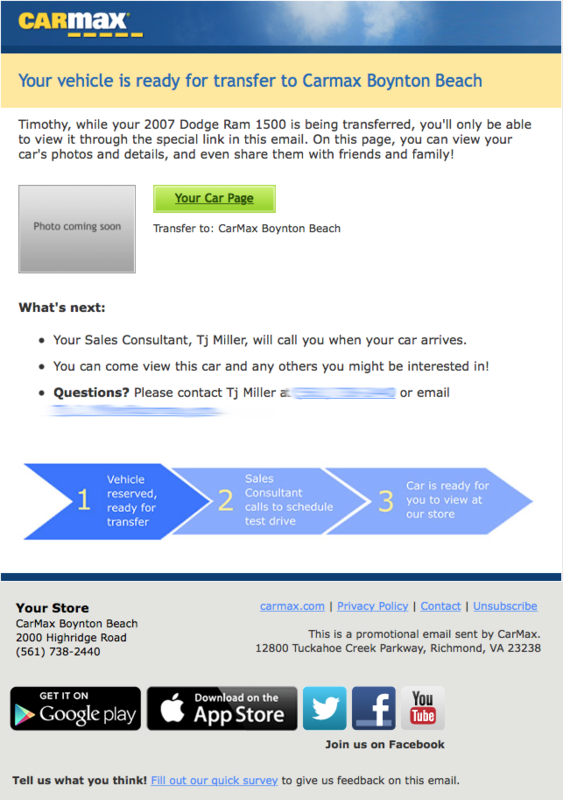 The email includes the recipient's first name, car model, and details about the car transfer. In instances where photos are available, it even includes a photo of the car. Subscribers forwarded this email to their friends and family to share information about their new purchase with others. It’s no surprise that this was in the top 1% of the most viral emails. 3) Your email asks them to it share with their network. Since subscribers are often on-the-go, and thus, more likely to skim your emails, making your calls-to-action (CTAs) as clear as possible is crucial. You explicitly ask your subscribers to “download” an ebook or “sign up” for a free trial, so why not ask them to share your email? Including a CTA to share your email can elicit shares. Our study found that the most forwarded emails were 13X more likely than the typical email to include “Share With Your Network” CTAs. By including forward-to-a-friend or social sharing links, you put it in your subscribers’ minds to share. Be sure to make it easy for them to share -- your buttons should be touch-friendly and have emails, tweets, and Facebook posts pre-populated with content. All your subscribers should have to do is click or touch the link. 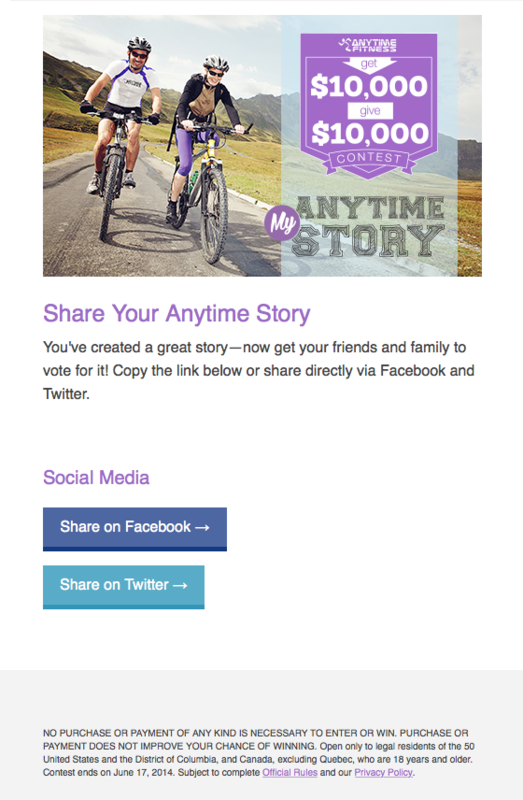 Also in the top 1% of viral emails, Anytime Fitness’s campaign encouraging their subscribers to share their fitness story was forwarded many times. By including links to share via email, Facebook, or Twitter, Anytime Fitness motivated their subscriber to share -- and they made it extremely easy to do so. 4) It's about something naturally shareable. While sending targeted messages, including personalization, and adding “Share With Your Network” CTAs are tactics to spur forwards, an email’s content also plays a role in whether it gets shared or not. Below are some of the most commonly shared email topics. Emails that included registration links or information about an event were the most common topic among viral emails. They were 3.2X more likely to be shared that typical emails. Since people want others to attend events with them, it makes sense that emails like this are more likely to get shared. This email from UF Alumni Association provides details about an upcoming tailgate. It’s no surprise that this was in the top 1% of viral emails -- those participating were likely to share with others that were attending as well. The information included, such as bag check procedures, is important to everyone attending. In second place, emails that contained news updates and helpful content were frequently shared. 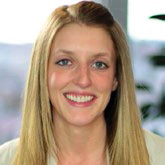 This is great news for email marketers. If you provide your subscribers with helpful, high-quality, newsworthy content -- perhaps linking to a few of your blog articles or an ebook -- then your email has a high chance of being shared. But, be careful to not be promotional. 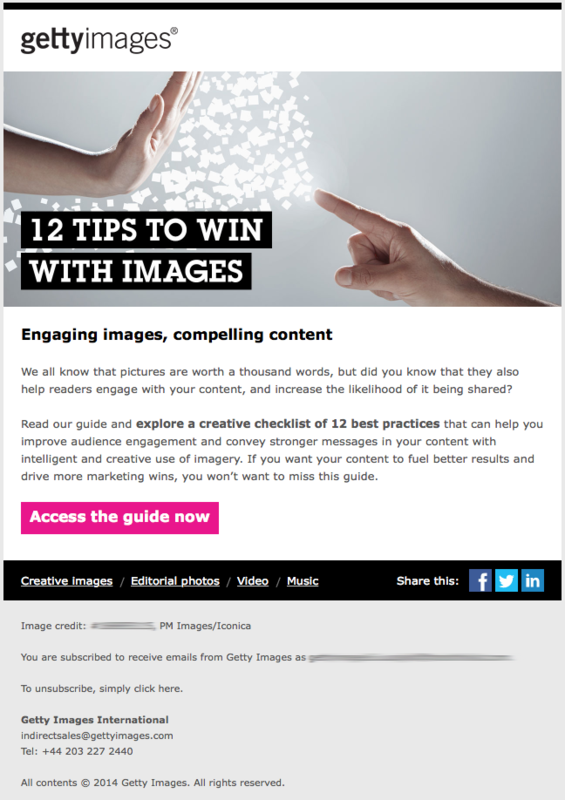 Getty Images’ email promoting their guide on creating engaging images was one of the most forwarded emails. While they’re linking to their own piece of content, they do it in a non-salesy way -- they focus on the value downloading the guide will bring to their subscribers. Unsurprisingly, emails containing important information, such as account changes or order confirmations, spurs forwards. People are likely sharing this information with others who are affected by the changes or need to be informed about an order. While these types of emails are often shared, they aren’t shared on a large scale that would help increase many other people to convert. 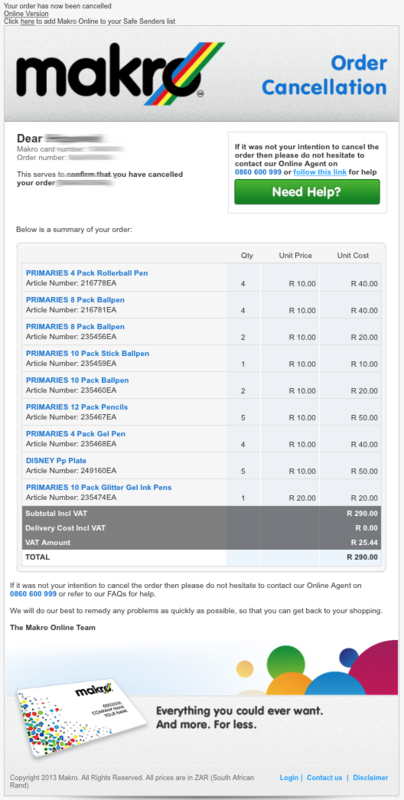 Order cancellation emails from Makro were frequently shared. While these likely weren’t tweeted about or shared with numerous friends, they were likely forwarded to others involved in the purchase. Perhaps it was forwarded to the credit card holder or the invoicing department of a company. Emails containing announcements like this were 6X more likely to be shared than those that don’t. Subscribers want to keep others that may be affected (or may benefit) from these types of announcements in the know. Similarly, store closings and product recalls were also forwarded a lot. This product recall email from IKEA was also one of the most forwarded emails. 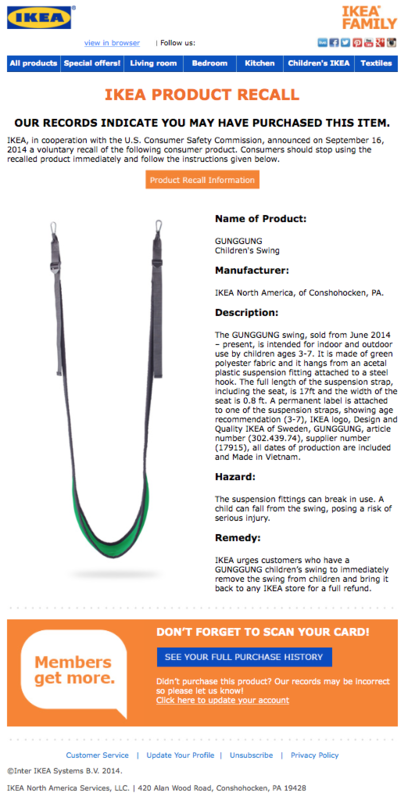 Subscribers likely wanted to inform others who also purchased the product of the recall. Emails about charitable and fundraising initiatives were 3X more likely to be shared than typical emails. Subscribers enjoy informing others about their contributions and evangelizing the charities they are interested in. 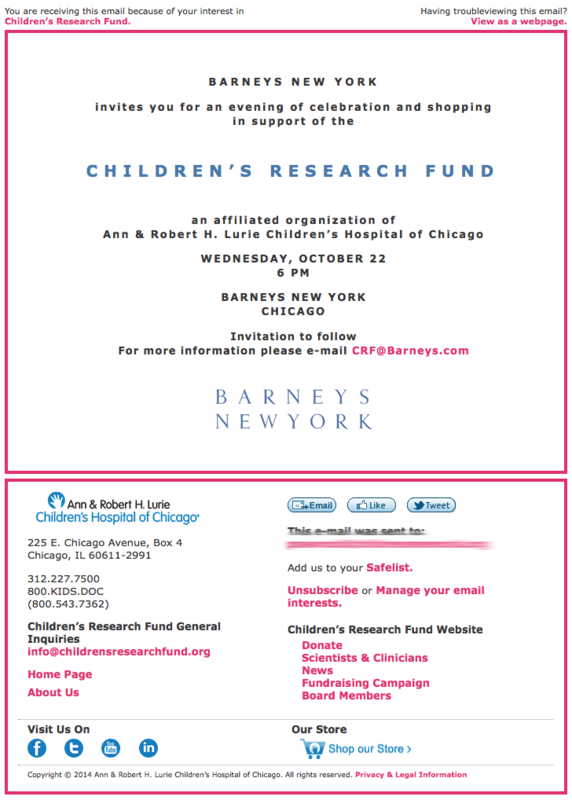 While it's also an event invitation (it's a double whammy -- event invite and charitable initiative), this email from the Children’s Research Fund was in the top 1% of viral emails. Subscribers wanted others to join them at the event and get involved in helping out a good cause. When subscribers forward your emails, they expand your reach, increase conversions, and boost your email engagement metrics -- which is great for branding, revenue, and deliverability. While promotional emails will always be a part of email marketing, try mixing it up a little. Experiment with an updated design, introduce something “new,” have a special deal, or simply just ask your subscribers to share your email. It all comes down to sending your subscribers content that they are interested in. If it’s important to them, they will share it. Get your copy of the Viral Email Report for more tips on how to get your emails forwarded.